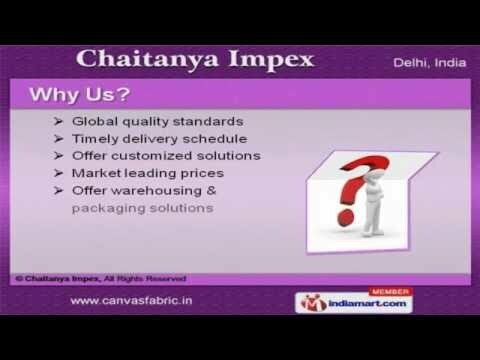 Welcome to Chaitanya ImpexManufacturer & Exporter of FabricsWe are an ISO certified company, established 2008. Well equipped infrastructures helpus to cater Indian Subcontinent & African countriesRidhi Sidhi Laminations Private Limited are some of our esteemed clients and we aresupported by Global quality standards & packaging solutionsWe offer a huge gamut of Drill & Air Mesh Fabrics. Our Voile & Linings Fabrics that are widely appreciated in the market. Shoe & Yarn Dyed Fabrics offered by us are available at industry leading prices. We offer Cambric & Poplin Fabrics unmatched in quality that are superior inperformance. Along with that we offer Twill & Duck Weave Fabrics that are extremely reliable. We also provide Pocketing & Canvas Fabrics that are nothing but the best solution forall your needs.